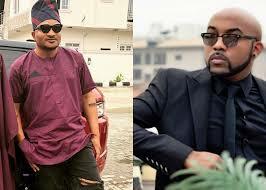 Nigerian music producer, Sunday Ginikachukwu Nweke, aka Masterkraft and banky w, has revealed how R&B singer and actor, Oluwabankole Wellington, Banky W helped him in his life before he attained stardom. Although Masterkraft made the rounds as the worst dressed guest during Banky W’s engagement, he hailed Banky W for keeping his promise to make him famous ever since he met him. According to him, the major turning point in his life was after he produced a song for Banky W which made it to the Newspapers. He told Punch “The turning point in my life came after I produced a song and they wanted to feature a rapper on it. They called MI and after he listened to it, he asked for the producer. He did not even believe that the song was produced in Nigeria. He later asked after me and when we met, he asked once more if I produced the song or copied it. At that point, I had to open my computer and show him my files. “Instantly, he called Banky W who called me immediately but I did not have his number, so I did not pick the call because they were recording and I did not want to disrupt the session. “A text message later came in stating that it was Banky W. It was an exciting moment for me and I remember that I ran out of the studio to the gate like four times just to get myself together and I called the number back. To my surprise, it was Banky W and he was asking for the address of my studio with the promise of showing up the next day. “True to his word, he came the next day, we sat down and he gave me an idea of the kind of song he wanted to release. In less than 30 minutes, I had produced the song. Banky was so much in awe that he told me that he had been in the state for years and had never had that type of result or sound. He said that for what I had done, he would make sure my name was everywhere and I got the first and second slot on his album. That was how I made it to his album. “The next thing was that I saw myself in the newspapers and it was Banky W that made it happen. That was a major turning point in my life. Shortly after I worked for his record label, EME, and I was the vocal coach for Wizkid and Skales at the time,” he said. Masterkraft further appealed to younger artistes and music producers to desist from alcohol and drug abuse under the guise of boosting their creativity. “I don’t think you need to enhance or boost your creativity with drugs. I believe that creativity is God-given. If you can harness your creativity without drugs, it would be good for you because you might find yourself in an environment where you would not find drugs. “I was built that way and it made me shun drugs. If I take anything, it affects my creativity; it dampens it. I can only take alcohol when I want to relax,” he added.